Affinity purified against recombinant protein GST-OTUB1 [DU 19741]. 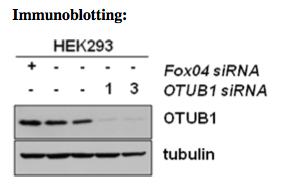 HEK293 cells were treated with 2 different siRNAs against OTUB1. 48h after transfection, cells were lysed and samples separated on an SDS gel. Primary antibody was used at a concentration of 0.1 ug/ml over night in 5% Milk-TBST. HaCaT cells were TGFb stimulated and OTUB1 was immunoprecipitated using 2ug of OTUB1 antibody per 1 mg of cell extract. Primary antibody was used at a concentration of 0.1 ug/ml over night in 5% Milk-TBST.